The Split Diamond pattern is named for the large diamond that has a vertical division. It is seen mostly in the small creamer shown above left. 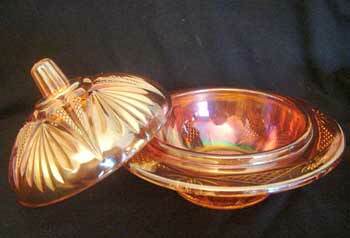 At the right is the companion sugar bowl, although covered sugars have been reported. Also known is a butter dish. 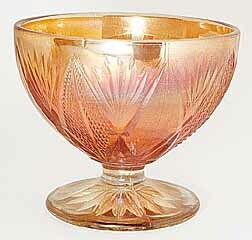 The pattern is thought to be by the English maker Sowerby, but no definitive proof exists. The bowl at the left sold as Split Diamond for $75 in 1995. While the pattern is similar, it is not the same. 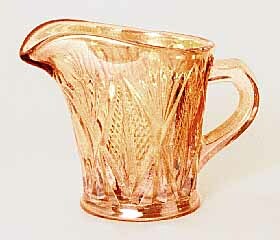 In addition, the feet are much like those found on some US Glass patterns. 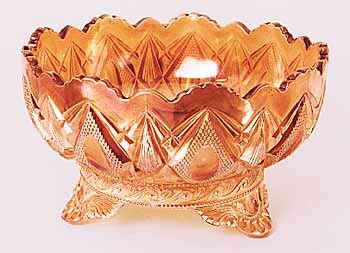 In May, 2003, Tony Hodgson reported that the feet on this bowl are found in the US Glass pattern Colorado. In 2007, Janine Northover of Australia sent me the photo at the left of her Split Diamond butter dish.